Here’s the latest videochat with fans. I have some updates on the movie (it’s still on, I’ve just had some technical roadblocks), but mostly just a bunch of rambling. 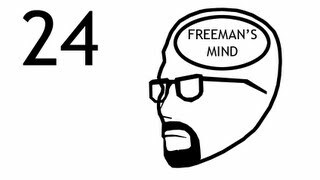 I’ll have more streaming this month along with (probably) more Freeman’s Mind. I swear I feel like he's about to cast some vodoo spell on me. Or maybe he's just summoning the space cats. Opus is an audio codec mostly meant for telephony and streaming, but it is also great at storing music (it supersedes Vorbis in that regard). From my A/B testing, it's indistinguishable at 128k bitrate. It unfortunately isn't used much (Youtube and some VOIP clients use it) because MP3 and Vorbis are "good enough" for most people. Dragon's Egg is a hard science fiction book about a neutron star that is inhabited by cheela, sapient creatures the size of a sesame seed. They operate on a time scale one million times that of humans, and the novel is about their evolution and communications with humans. At least before he brought up Quarantine. 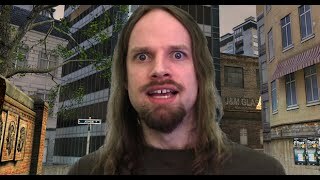 I don't know how you're doing motion capture, but I've found the Kinect does fairly high-quality captures for my purposes. It does have a downside in being one viewpoint, as opposed to full-surround captures. I recommend using a number of basic animations and blending through them - 'TalkGeneral, TalkEmotive, TalkEmphatic' moving the head in looped motions. Use UE4's AI controllers to just set up the characters to walk around between full-captured animations. Have blended full-body motions too, like 'IdleSassy, IdleWorried, IdleBored' etc. Using these methods you can save a lot of time, but it requires a bit of groundwork. As far as lip-sync goes, it's up to you whether you want to have a generic mouth movement, a programmatic approach or custom-made animations for each sentence (in order of ascending difficulty). Blendshapes can be used for facial animations as well, for a very quick approach - that way you just specify timelines of phenotypes; 'HH-Eh-Loh-FF-RR-EH-NN-DH'. You just cycle through each facial blendshape. The same thing can be done for emotions on the face. Most of what you want can be done through blendshapes and timelines. Like the part about movie titles, it's like they don't want to number sequels anymore. Have you looked into MakeHuman? It's a free and open sourced character creator that has dynamically scaling body rigs, even the face's blendshapes change according to the changes made to the model. The models it makes can be imported into Unreal and Unity I believe as I've seen guides, but I've only really just started messing with the software so I'm not 100% certain. The main downer about MakeHuman seems to be its general lack of clothing and hair options. There just isn't enough user-generated content for this software to really make up for the lack of built-in content. But hey, it might be worth trying since it's free and all. I feel like when you used to get questions like, “What’s a controversial opinion you hold?” or “What are your political views?”, you wouldn’t answer. I kind of wish you would’ve stuck to that practice. There are some views I want to know people whose content I like hold. It’s like JonTron all over again.